With a newborn you’ll want to try to keep her wake times to a minimum between 1-2 hours so she doesn’t get overtired, but I am glad to hear she’s been doing some longer stretches at night! If you find the long sleeps during the day are keeping her up at night you may try going through the schedule and waking her after a couple hours to make sure her days and nights even out. I hope this helps! If we were looking to try this schedule, do you recommend waking babies up from naps if they go longer than 30-60 minutes? Our 4 week old can go sometimes 3 hours if he is comfortable and in the rock n play or with one of us. I hope this helps! Thanks for reading and we hope we can be here to help through all the growing your sweet one will be doing! My daughter is 11 days old. Do you think she is to young to start this schedule? I know that it says 2 -8 week olds. Thank you!!!! @Sarah – Thank you for reading and congratulations on your new baby! 🙂 We generally tell parents that it’s never too soon to start laying a healthy foundation for your baby’s sleep. So long as you work within her needs and keep your expectations super realistic and flexible as she’s a newborn who needs lots of sleep and lots of feedings at this stage, this should be perfectly fine. Best of luck to you! @Sharika – Thank you for reading and for sharing. I know how exhausting and confusing this type of behavior can be – who would ever have thought that your baby sleeping for long stretches at night would be cause for worry! Babies her age are becoming much more alert during the day which can cause them to sleep a bit more in the night, for sure. Your daughter’s healthcare provider would be better able to let you know how she’s doing with her feeding and health overall depending on if she’s growing well from birth. This article goes over a 3-month old’s sleep in a bit more detail, which you may find helpful as you work through her sleep vs feeding needs: https://www.babysleepsite.com/schedules/3-month-old-baby-sleep-and-feeding-schedule/ If you find you need more support, please consider connecting with one of our consultants – http://www.babysleepsite.com/about Hang in there, Sharika! 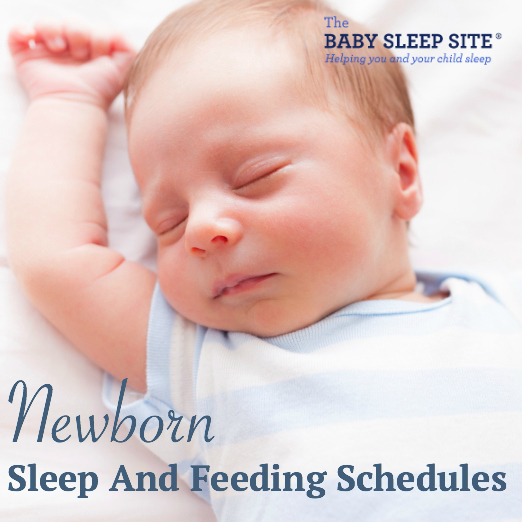 Hi Emily DeJeu, such a wonderful post on newborn baby sleep and feeding schedule. Thanks for sharing this post with us. Keep sharing. Hi @Thiranya Ravi, thank you for your comment, we are glad the article was helpful! Hi, my 4 week old is now sleeping longer at night and less in the day but I just want to know should we wake her so she can eat at night or let her sleep until she wakes up for a feeding? During the day she eats 3-4 ounces every 3-4 hours of formula, She is past her birth weight as well. Thank you for visiting The Baby Sleep Site! Usually, we do recommend waking baby to eat during the day, but not at night at this age, if she was born on time and is generally healthy. However, you should check in with her pediatrician, as it can depend on her growth curve and we definitely want to make sure she’s getting enough to eat 🙂 Hope this helps, and good luck! I just wanted to say I’ve been following this sleep/feeding schedule since my newborn was 3 weeks old, and since then she’s been sleeping up to 9 hours a night and only short naps through the day rather than the other way around!! You’ve saved me weeks of sleeplessness so I wanted to thank you!!! @Kamie, Woo-hoo!!! That is awesome! We are so glad things have been going so well for you and hope they continue. 🙂 Thanks for using the Baby Sleep Site as a resource for sleep help. this means that if my baby wake and feed for like 30mins than there is 1hour for him to play and 30mins to fall aspeep? Hi @Zane, thanks for writing! This would mean that from the time your baby wakes up, you would have 2 hours to feed, play, and help them sleep again. It is simply that they would not be awake longer than 2 hours total, so if it takes about 30 minutes to get your baby asleep, then yes, that is what it would look like for you. I hope that helps clarify! My 2.5 month old is not napping longer than 30 minutes at a time then will take one longer nap most days. What is the recommended length of a nap for this age? Is this something I should work on with him? Hi @Alison, thanks for your comment! Short naps are pretty common at this age so I wouldn’t worry about it too much unless it is still going on by 4 months or so. If you haven’t yet, here is a link to a free ebook with information that will be helpful to have on hand: https://www.babysleepsite.com/15-free-baby-sleep-facts-new-parents-must-know/ Hope this helps! I need help with my 7 week old. My first child would’ve been able to follow your plan above beautifully since she fed for 30-45 minutes each feed and slept for 1-1.5 hours each nap (she’s 5 now and I don’t remember exactly what she did at 7 weeks) but my new LO is a whole other bag!! I EBF (as I did with the first kid) but LO has reflux (first kid didn’t have it so I’m lost in the sauce!) and will not go any longer than 1.5-2 hours between feeds during the day, then a 4-5 hours stretch at night before going back to the 1.5-2 hours. Ok no biggie, but she only sleeps 30 minutes at each nap during the day. I know that the above info says that’s ok, but I’m confused with the schedule. What am I to do with my LO between feeding and getting to sleep? I try to get her in her play yard and bouncer but that doesn’t last long- 30 minutes tops- since she’s quite a fussy girl. She acts so tired only 30-45 minutes after I feed (she feeds 5-8 minutes on each breastfeeding) her so I’ve tried watching her cues and get her down for a nap but either it takes forever to get her to sleep or she goes right to sleep and is up in 5 minutes and I wait a bit and try again after she’s gotten a bit more tired looking. She also won’t sleep in my arms or in the carrier, and will only sleep in a rock n play sfter rocking her to sleep. We have a dark room and swaddle. So are her sleep cues true or is she just kinda tired from dealing with her reflux? I need to figure her out because I work from hone and I’m afraid I’ll get fired since I have to spend so much time trying to get her to sleep. Please help! Hi @Alicia – Thank you for writing to us! Sorry that you are having a tough time with baby number 2! If all babies were simple, and had sleep (and feeding) issues that were “easy” to solve, we’d all have a lot more time on our hands! All babies are so different, as are their sleepy signs, sleep needs, and sleep habits! Many parents in this situation find that baby wearing can help calm/soothe/etc during awake times, and depending on what you use, the positioning can help with reflux too! Wearing baby also helps free up your hands! Crib aquariums, and swings can help during awake times too. #0 minutes in any one place is quite a while at this age too, so if she is content in her bouncer for 30 minutes, I would call that a win! Regarding her schedule and catching her at just the right sleepy time, you may need to play around with watching those more subtle of signs, and getting her down before she is too tired. Feeding a newborn can be challenging, confusing and overwhelming at the same time. So, how do new parents go about it? Read on to know more. @Amy – Thank you for your comment! @Jordan – Thank you for your comment and congratulations on your new baby. I am glad to hear he is sleeping good stretches for you and it sounds like nursing is going really well too! If you are happy with the way things are going right now, I wouldn’t stress yourself out trying to change things just yet. As he gets older you will want to think about a more solid schedule, or if you start to notice he is developing some bad habits and is dictating how things go a little too much, then that is a good indicator it may be time. Please let us know if you have any other questions along the way, we are here to help! I need some advice. My 5 week old will sleep only if she is swaddled. She will also sleep thru the night and not wake up for a feeding. My questions is do I wake her up at night for a feeding or just let her sleep? She also will sleep most of the day if I keep her swaddled. If I take her out and wake her up, she starts fussing. Is she getting too much sleep? @Melissa – Thank you for stopping in to our sleepy little village. Congratulations on your new little girl! 🙂 This is a great question and one I’m afraid we can’t answer with 100% certainty. This would be a question better posed to your daughter’s medical provider. Frequently, once a baby has reached a certain weight and trend in their growth as newborns, it’s okay to let them sleep longer than 2-3 hours without having to wake them up to feed them. But, if they haven’t yet regained all their birth weight and developed a trend in weight gain, you’d want to keep waking them to feed them. I wish I could be of more help here for you, Melissa, but reach out to her medical provider as I’m certain this is something they can quickly clear up for you. I hope this is helpful! Please stop in to see us again soon, Melissa.